It has been awhile since I have done anything "special" for my spouse. I always like to come up with something little and meaningful. Sure buying a gift is fun, but I love putting thought into a craft or project to give. Plus, this was free and quick! The weekend was almost here, so I thought I would make a note. 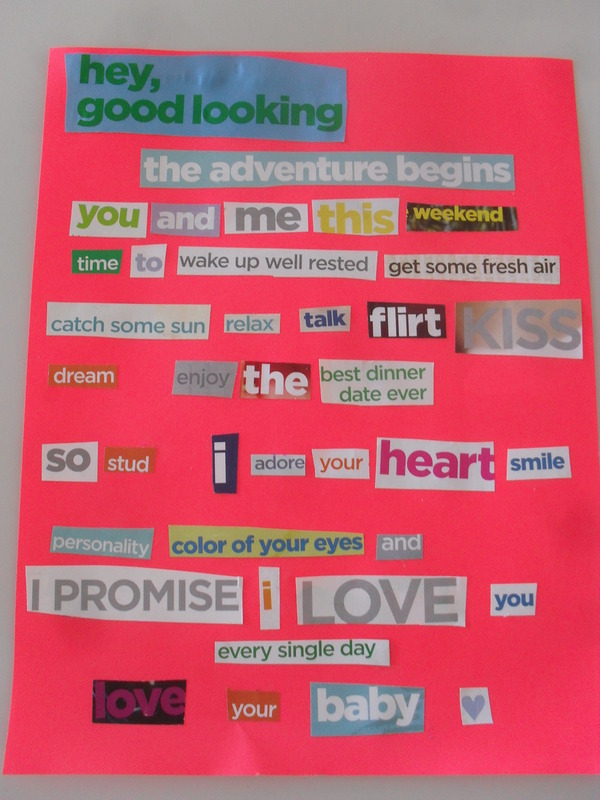 Instead of writing one, I would use words that were cut out from a magazine. I already had a bag full of words ready. Awhile back I liked making collages, so I had different words cut out and ready to use. I was happy to have a head start on the first step. I then think had to put on my thinking cap and devise a message! This took me awhile. I would get going on something good, then would be missing one letter or word and have to start all over! Finally, I managed to make a message, themed for the upcoming weekend. I made sure to lay out the words on card-stock before gluing. This helped because I was re-arranging my message like crazy. Once ready, I glued the words to the paper and was done! I then left out my note in a hidden place where only Derek would see it. When he found it, he was so surprised. He loved it so much he bought a frame to put it in! That is why I love the simple and thoughtful gifts. It really can make someones day. It also brings me so much happiness when I see how much it meant to someone. It is the little things that count! Frame if you desire or leave in a secret spot to surprise that someone special!